Designer Rajguru Saree Collection at a Fashion Show in Bangalore. 1. 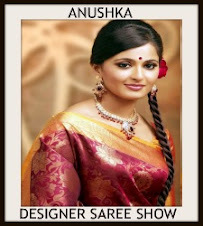 Model displaying beautiful gold designer traditional silk saree. Gold printed designs all over saree. It is a multicolor unique border. Gold printed flowers through out pink silk border. Paired with pink designer short sleeves saree blouse with wide neck pattern. Gold printed work on the shoulders. 2. Model walks in beautiful black and tan designer half and half saree. Beautiful embellished floral designer half of the saree with gold zari border. It has running pallu. Paired with black designer short sleeves saree blouse with wide neck pattern. 3. Model displaying beautiful pink and green designer half and half saree. Gold embellished applique patch work through out green saree. Embellished floral designs through out pink saree. Border is highlighted with gold embellished patch work. Paired with designer short sleeves saree blouse. 4. Model walks in beautiful black designer saree with printed leafs all over and pink plain border. Embroidered sequins and thread work around the pink border. Paired with gold designer embroidered short sleeves saree blouse. Heavy embellished patch work highlighted. 5. Model displaying beautiful multicolor silk saree. Embellished mango motifs and multicolor checks all over saree with gold zari border,followed by pink,blue borders. Paired with pink designer short sleeves saree blouse. 6. Model walks in beautiful white designer silk saree. 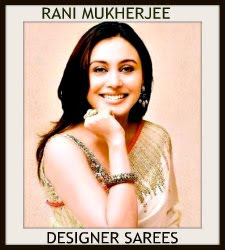 Black designer printed work all over saree and multicolor borders. Paired with designer sleeveless saree blouse. 7. Model displaying beautiful pink designer saree drape. Blue printed work all over saree and tricolor border. Paired with designer mini sleeves saree blouse. 8. Model walks in beautiful green designer plain saree with yellow and pink unique borders. Small stripes through out yellow border,embroidered sequins buttes all over pink. Paired with black designer embroidered full sleeves saree blouse. 9. Model displaying beautiful designer half and half saree. Pink and black checks half of the saree. White horizontal stripes half of the saree and tricolor borders. Paired with black designer mini sleeves saree blouse. 10. Model walks in beautiful yellow and magenta designer half and half saree. Magenta and yellow printed work half of the saree and gold plain border,black border around it. Paired with yellow designer cap sleeves saree blouse with square neck pattern. 11. Model displaying beautiful pink designer saree with multicolor borders. Embellished applique mangos half of the saree. Paired with green designer short sleeves saree blouse with open neck pattern. 12. Model walks in beautiful yellow and white designer half and half saree with green,gold borders. Black printed designs all over white. Paired with yellow designer short sleeves saree blouse with round neck pattern. 13. Model displaying beautiful red and white designer silk half and half saree. White and red printed designs through out white saere and green,gold borders. It has running pallu. Paired with red designer full sleeves saree blouse with wide neck pattern. 14. Model walks in beautiful pink and blue designer half and half saree. Gold printed designs through out pink. Blue embellished work all over blue and gold zari border,pink border around it. Paired with blue and pink designer 3/4th saree blouse. 15. Model displaying beautiful yellow designer saree with green and blue borders. Embellished applique patch work through out pink border,gold thread work around it. Paired with green designer mini sleeves saree blouse with ‘V’ shape neck pattern. 16. Model walks in beautiful red designer plain saree with pure gold zari border,running pallu. Contrast with green designer short sleeves saree blouse with round neck pattern. 17. 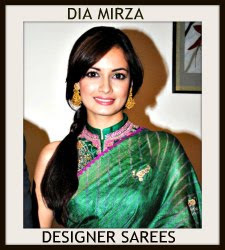 Model displaying beautiful green designer embroidery net saree. Embroidered mirrors all over saree. Pink printed designs through out gold border. Contrast with gold designer embroidered short sleeves saree blouse. Model displaying beautiful white and black designer dual color net saree. Designed by Varun Bahl at PCJ Delhi Couture Week 2013. Pink embellished applique patch work around the double border. Paired with designer sleeveless saree blouse. Embellished floral designs all over. Model walks in beautiful grey designer bridal lehenga style saree. Red and grey embellished patch work all over lehenga and through out maroon border. It is a embroidered netted dupatta with patch work border. Paired with designer full sleeves saree blouse for back. Embellished patch work all over blouse. Model displaying beautiful grey designer pure georgette saree with plain border. Red and yellow embellished patch work on it. Contrast with black designer quarter sleeves saree blouse with square neck pattern. Model walks for Varun Bahl at PCJ Delhi Couture Week 2013. It is a light pink designer bridal lehenga. Heavy embellished floral designs all over lehenga and through out yellow border. It is a Grey designer embroidered dupatta with double border. Paired with designer short sleeves saree blouse. Model walks in beautiful peach designer embroidery shimmer faux georgette saree. Gold embroidered zardosi,motifs and applique patch work all over saree. Double borders highlighted. Gold patch work around the border. Paired with designer embellished 3/4th saree blouse for back with round neck pattern. Model displaying beautiful blue designer embroidery lehenga. Embroidered sequins buttes and yellow and silver embellished applique patch work all over lehenga and tan border. It is a netted dupatta with embroidered border. Paired with designer embellished full sleeves saree blouse for back. Model displaying beautiful yellow designer lehenga. Grey and light pink embellished patch work all over lehenga and across the border,followed by tan border. It is a grey and yellow dual color dupatta with yellow,silver borders. Paired wit designer embellished short sleeves saree blouse with square neck pattern. 1. Model walks in beautiful black designer plain drape saree. Contrast with white saree blouse. Patch work on it. 2. Model displaying beautiful pink designer netted lehenga. Red and black embellished applique patch work all over lehenga. Gold zari work across the border,followed by red borders. It is a grey designer embroidered dupatta. Embroidered sequins buttes on it and double borders. Paired with black designer embellished 3/4th saree blouse. 3. Model walks in beautiful black and peach designer half saree. Black heavy embellished applique patch work all over lehenga,black and silver plain borders. It is a black georgette saree with patch work border. Paired with designer short sleeves saree blouse with square neck pattern. Patch work on it. 4. Model displaying beautiful pink designer lehenga with black plain border. Printed rose flowers all over lehenga. It is a black georgette dupatta. Paired with black designer 3/4th saree blouse. Patch work on it. VArun Bahl Saree Collection at PCJ Delhi Couture Week 2013. 1.Model walks in beautiful white designer embroidery bridal lehenga. Silver embellished patch work all over lehenga and around the border.It is a pink embroidered netted dupatta. Silver embroidered zardosi all over dupatta. Sequins buttes through out border. Paired with designer embroidered short sleeves saree blouse with round neck pattern. 2. Model displaying beautiful peach designer georgette saree. Rand pink embellished flowers all over saree,grey designer patch work around the border. Paired with designer embroidered short sleeves saree blouse with square neck pattern. 3. Model walks in beautiful designer shimmer faux georgette saree with silver border. Red embellished rose flowers on it. Paired with grey designer short sleeves saree blouse with wide neck pattern. 4. Model displaying beautiful pink and red designer half saree. Silver and red heavy embellished applique patch work all over lehenga and through out border. It is a red netted dupatta with patch work. Paired with red designer embroidered short sleeves saree blouse with round neck pattern. 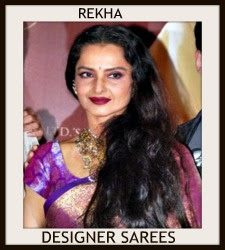 Designer Preeti S Kapoor sarees at Day 5 Lakme Fashion Week Winter/Festive 2011. 1.Model displaying green designer embroidery shimmer drape saree with gold zari border and studs work paired with designer embroidered full sleeves collared blouse. 2.Model walks in pink designer embroidery georgette shimmer saree with gold embroidered lace border and sequins work paired with designer embroidered short sleeves saree blouse with round neck pattern. 3.Mode displaying beautiful purple designer shimmer saree with embroidered,green designer lace border paired with designer embroidered short sleeves saree blouse. 4.Model walks in gold designer shimmer faux georgette saree. The border is highlighted with embroidered,sequins buttes and lace border work paired with designer embroidered full sleeves Collared saree blouse. 5.Model displaying beautiful blue designer embroidery shimmer saree with gold embroidered and maroon border work paired with designer embroidered short sleeves saree blouse with round neck pattern. 6.Model walks in beautiful orange designer embroidery shimmer faux georgette drape saree. The border is decorated with embroidered sequins buttes,mirror and studs work paired with designer embroidered quarter sleeves saree blouse. 7.Model walks in purple designer embroidery shimmer saree with gold border paired with designer embroidered ruffled sleeves saree blouse. 8.Bollywood actress Lucky Morani in beautiful cream designer embroidery shimmer faux georgette saree with embroidered border and sequins work paired with designer embroidered short sleeves saree blouse. 9.Model displaying green designer embroidery shimmer saree with embroidered border, patch work paired with designer embroidered full sleeves saree blouse. 1.Richa Gangopadhyay in beautiful red designer embroidery shimmer faux georgette saree with mirror and lace border work paired with designer halter neck saree blouse. 2.Bollywood and South Indian actress in beautiful light pink designer shimmer faux georgette saree with gold lace border work paired with designer embroidered short sleeves saree blouse. 3.Kushboo in beautiful blue designer silk saree with printed and gold patch border work paired with designer quarter sleeves saree blouse. 4.Lakshmi Prasanna in beautiful pink and green designer embroidery shimmer faux georgette saree with lace border and mirror work paired with designer embroidered full sleeves saree blouse with round neck pattern and sequins buttes. 5.Siya in beautiful green and purple designer lehenga style saree with embroidered mirror and border work paired with designer sleeveless saree blouse. 6.Parul Yadav in beautiful red and green designer saree, embellished with patch border work paired with designer quarter sleeves saree blouse with square neck pattern. 7.Lakshmi Rai in beautiful red and black designer embroidery gorgeous saree with gold border work paired with designer sleeveless saree blouse. 8.Shriya Saran in beautiful black designer lehenga style saree with gold printed and lace border work paired with designer sleeveless saree blouse with ‘V’ shape collar neck pattern. 9.Bindu Madhavi in beautiful grey and black designer saree with printed and double border work paired with designer full sleeves saree blouse. 10.South Indian actress displaying beautiful blue designer georgette saree with polka dots and border work paired with designer saree blouse. 1.Model displaying pink designer embroidery pallu saree with mirror work paired with designer embroidered sleeveless saree blouse for back. 2.Model displaying beautiful red designer embroidery saree drape paired with designer embroidered short sleeves saree blouse. 3.Model walks in mustard designer embroidery shimmer saree with lace border work paired with designer embroidered saree blouse. 4.Model walks in beautiful pink designer embroidery reverse drape saree with embellished border paired with designer short sleeves saree blouse. 5.Model walks in gold designer embroidery shimmer faux georgette saree with sequins buttes,patch and lace border work paired with designer embroidered short sleeves saree blouse. 6.Model walks in beautiful yellow designer shimmer faux bridal saree with heavy embroidered and lace border work paired with designer embroidered short sleeves saree blouse. 7.Model displaying pink designer embroidery shimmer saree with sequins buttes, mirror and lace border work paired with designer embroidered sleeveless saree blouse with ‘V’ shape collared neck pattern. 8.Model displaying beautiful green designer embroidery shimmer saree with sequins buttes and embroidered backless saree blouse. 9.Model displaying blue designer embroidery saree style with embroidered border and sequins buttes paired with designer embroidered full sleeves saree blouse for back with collar neck pattern. 10.Model walks in beautiful green designer shimmer faux georgette saree with lace border work paired with designer saree blouse. 11.Model displaying moss green designer embroidery reverse drape saree with sequins buttes,mirror and lace border work paired with designer embroidered one shoulder saree blouse. 12.Model displaying red designer embroidery shimmer faux georgette sare with embroidered lace border and sequins buttes paired with designer embroidered sleeveless saree blouse. Left:South Indian lead actress Samantha in beautiful green designer saree paired with ruffled sleeves saree blouse at Dookudu Success Meet. Right: Samantha in beautiful yellow designer saree. The border is decorated with designer embroidered sequins buttes and lace border work paired with designer full sleeves saree blouse with round neck pattern at Mahesh Babu Dookudu Audio Launch. Left:Samantha in beautiful green designer half saree with polka dots and border work paired with designer quarter sleeves saree blouse. Right:Samantha in blue designer gorgeous shimmer saree paired with designer saree blouse. Left:Samantha in beautiful pink designer shimmer saree with multicolor unique embroidery border work paired with sliver embroidery halter neck saree blouse at 58th idea Filmfare Awards South 2011. Right:South Indian actress Samantha in beautiful green designer dual color saree drape with lace border work paired with designer ruffled sleeves saree blouse with round neck pattern at Dookudu Success Meet. Left: Samantha in blue designer traditional silk saree with printed work paired with designer saree blouse. Right: Samantha in blue designer gorgeous saree with green lace border paired with designer short sleeves saree blouse. 1.Aishwarya Rai spotted in Sabysachi saree paired with embroidery saree blouse at Raavan Premiere at London. 2.Shriya Saran in green designer handloom saree with embroidery zari border paired with full sleeves embellished matching blouse at Handloom Fashion Show in Chennai 2010 from designer Sabyasachi. 3.Sruthi Haasan in beautiful embroidery full sleeves saree blouse. 4.Aishwarya Rai in gold designer saree with zari border paired with quarter sleeves saree blouse at Khelein Hum Jee Jaan Se Premiere. 1.Taapsi in beautiful maroon and green designer embroidery shimmer saree with embroidered lace border, sequins and zari woven paired with embroidered sleeveless saree blouse with open neck pattern. 2.Taapsi in beautiful green designer traditional silk saree,embellished with patch and embroidered border work paired with designer embroidered short sleeves saree blouse. 3.Taapsi in beautiful maroon designer traditional saree with designer gold border work paired with designer full sleeves saree blouse at Sripalam Show Room Launch. 4.Taapsi in beautiful red designer traditional silk saree,embellished with patch and embroidered border work paired with designer embroidered short sleeves saree blouse. 5.Taapsi in beautiful green designer embroidery shimmer saree with mirror,studs, kundan and embroidered border work paired with designer sleeveless saree blouse. 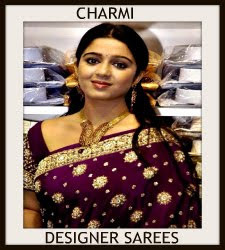 6.Taapsi in beautiful purple designer embroidery shimmer saree with silver lace border work paired with embroidered sleeveless saree blouse at Big Telugu Movie Awards 2011. 7.Taapsi in beautiful green designer floral embroidery Georgette sari with floral work aroung the border paired with designer double border work paired with designer saree blouse. 8.South Indian actress Taapsi in beautiful green designer half saree with embroidered lace border work paired with designer saree blouse. 9.Taapsi in amazing embroidery Lehenga Style Saree paired with embroidery saree blouse. Bollywood actress Madhuri Dixit in beautiful red designer embroidery lehenga. Beautiful gold thread work all over lehenga with tricolor unique border. It is a white embroidered netted dupatta. Embroidered sequins buttes all over. Embellished applique patch work around the red border. Paired with blue designer embroidered quarter sleeves saree blouse with open neck pattern. Embellished patch work around the neck. Left: Madhuri Dixit in beautiful pink designer embroidery lehenga with tan border. Embroidered mirrors all over lehenga. It is a red embroidered transparent dupatta with gold border. Contrast with blue embroidered short sleeves saree blouse with ‘V’ shape neck pattern. Embroidered mirrors all over. Middle: Madhuri Dixit in beautiful black designer transparent saree. Embellished patch all over saree. Embroidered sequins buttes around the border. Paired with pink and gold designer sleeveless saree blouse. Right: Madhuri Dixit in beautiful pink designer embroidery georgette saree with embroidered mirrors all over. Gold thread work through out border. Paired with green designer sleeveless saree blouse. Embellished rose flowers all over. Left: Madhuri Dixit in green designer embroidery saree. Embroidered mirrors all over. Border is highlighted with embellished flowers and pearls. Paired with green designer cap sleeves saree blouse/. Embroidered sequins buttes across the border. Middle: Madhuri Dixit in beautiful green designer with embellished mangos all over. Embroidered work through out green border. It is paired with embroidered full sleeves saree blouse. Right: Maduri Dixit in beautiful blue designer embroidery shimmer faux georgette saree. Silver embellished floral designs all over saree. Paired with designer short sleeves saree blouse. Designer Nitya Singh saree collection at Pune Style Fashion Week. 1. 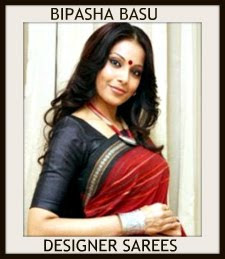 Model displaying beautiful black and white designer georgette saree. Black and white polka dots all over saree with black simple border. Paired with black designer short sleeves saree blouse with round neck pattern. Small polka dots on it. 2. Model walks in beautiful designer multicolor saaree. Multicolor stripes all over saare. Paired with black designer short sleeves saree blouse with round neck pattern. 3. Model displaying beautiful blue designer georgette saree. Black and blue printed designs and black stripes all over saree. Paired with black designer full sleeves saree blouse with wide neck pattern. 4. Model walks in beautiful pink and black designer transparent saree. Black and pink printed designs and black stripes all over saree with black border. Paired with black designer full sleeves saree blouse with wide neck pattern. 5. Model displaying beautiful black designer printed georgette saree. Self printed,small polka dots and horizontal stripes all over saree. Multicolor embellished floral designs through out border. Paired with pink designer short sleeves saree blouse for back. Left: South Indian actress Kajal Agarwal in beautiful off white designer full sleeves saree blouse with round neck pattern. It is a silk saree blouse. Brasso work on it. Right: Kajal Agarwal in beautiful designer black saree blouse with round neck pattern. Black embellished patch work designs all over and through out neck. Kajal Agarwal in beautiful black designer full sleeves saree blouse with round neck pattern. Silver embellished patch work designs all over blouse. Small sequins buttes through out border. Manish Malhotra Saree Collections at day 5 of Lakme Fashion Week Winter/Festive 2011. Model displaying white and gold designer dual color shimmer gorgeous saree with embellished border work paired with designer full sleeves saree blouse from designer Manish Malhotra at day 5 of Lakme Fashion Week Winter/Festive 2011. 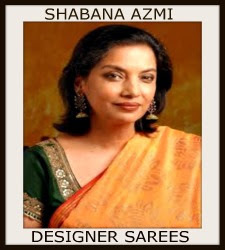 The tale of a saree and a blouse is like a partnership that stands strong over a period of time. They compliment each other and look incomplete in the absence of another. Sari is a six yards long piece of cloth which is draped in a unique fashion. 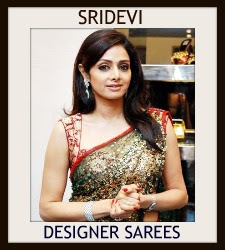 A woman looks graceful in a saree. Blouse and petticoat are two other essential garments that are worn along with a saree. 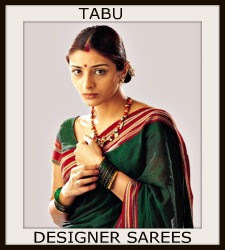 The blouse which mostly looks like a piece of shirt is worn inside a saree and is partly visible that partly covers the torso of a woman. Blouses have buttons and they can be either in the front or at the back. Today, sari has become a fashion statement and a lot of designers have their exclusive collection along with variety of designs of blouses. Now days knot blouses are also very much in vogue. A blouse reveals more than it conceals. Its cut, color and the way it is worn would tell you about whether the woman is casual, carefree, bold, reticent or orthodox. It is a dead giveaway of a woman’s attitude and personality. Little wonder, blouses are no longer treated as mere decorative garments. As designer Suneet Verma puts it: "It is a statement of a woman’s sense of freedom, an expression of female vanity and, most importantly, a celebration of feminine grace." Today there are designer blouses that are given a lot of time and attention while getting made. Blouses have lots of varieties, like backless, choli, high neck, transparent and one with strings. The more revealing they are, sexier the sari looks. But of course the conventional blouse adds grace and elegance to ones persona and reflects the expression of female vanity. Designer Blouses: Designer blouses changes the ultimate look of a saree. Designer blouses are in different cuts and styles and gives a best look to the saree outfit. Embroidery Blouses: Embroidered blouses are available in different embroideries like kundan, sequins, dabka, neemzari, zardozi and lots more giving a classy look to sarees. Sari Blouse Neck Styles: With the changing times, blouses have also undergone a large change. Various neck styles like boat neck, deep neck, collar neck styles are quite in vogue. 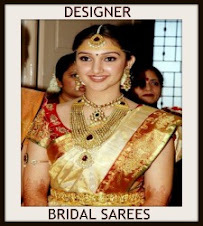 Sari Blouse Sleeve Styles: Sleeve styles play a vital role in making a blouse look stylish. Bell sleeves, sleeveless, mega sleeves, frill sleeves, full sleeves, quarter sleeves are quite in fashion. 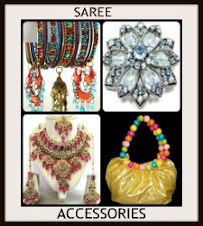 Saree Blouses, Saree Blouse Patterns,Blouses for Sarees, Saree Blouse Designs 2010,Saree Blouse Designs and Patterns,Saree Blouse Designs front and Back,Saree BLouse Designs halter neck,Saree blouse styles,Cholis, Designer Choils, Embroidery Choils, Embroidery Saree Blouses,Sari Blouse Designs,Sari Blouse Designs 2010,Bridal Saree Blouse Designs, Wedding sari blouse designs. More Saree Blouse Designs and Saree Times Blouse Designs Guide. Designer Rahul Mishra sarees at Rahul Mishra Taj. 1.Model displaying white designer printed pochampally saree with tricolor border work paired with designer collared sleeves saree blouse. 2.Model walks in black designer saree with printed and tri color border work paired with designer full sleeves saree blouse with round neck pattern. 3.Model displaying beautiful white designer saree with paint work and border work paired with designer halter neck saree blouse. 4.Model displaying white designer drape saree with designer border and paint work paired with designer full sleeves saree blouse with collared neck. 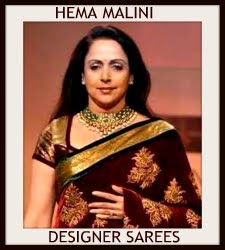 Designer Neeta Lulla Sarees at Day 4 LFW Winter/Festive 2011. 1.Model displaying beautiful red designer shimmer saree with embroidery patch work ,lace bordered paired with ruffled sleeves half sleeves saree blouse. 2.Model displaying beautiful red designer shimmer saree with embroidery ,thread patch and border work paired with ruffled sleeves saree blouse. 3.Model displaying beautiful red designer shimmer saree with embroidery ,thread and zari wovens and border work paired with ruffled full sleeves with hemline saree blouse. 4.Model displaying beautiful dual color of blue and pink designer shimmer saree with embroidery ,thread and sequins buttes border work paired with full sleeves designer saree blouse. South Indian actresses in saree at ‘Life is Beautiful’ Audio Launch. Left: South Indian actress Kavya in beautiful blue designer embroidery shimmer faux georgette saree with embroidered sequins buttes,patch and border work paired with designer cap sleeves saree blouse. Middle: Zara in beautiful orange designer plain saree with border work paired with designer full sleeves saree blouse. Right:Rashmi in beautiful white designer georgette polka dots saree with embroidered sequins buttes and border work paired with designer full sleeves saree blouse at ‘Life is Beautiful’ Audio Launch. South Indian actress Taapsee in beautiful bridal silk sarees from famous South Indian designer Gaurang Shah. Left: Taapsee wearing black and pink kanjeevaram bridal saree with followed by gold zari woven border. Paired with designer full sleeves saree blouse with round neck pattern and kalamkari work. Middle: Taapsee in white and black combination checks uppada silk jamdhani saree, Teamed up with Bright pink jamdhani weave floral work heavy border. Paired with designer full sleeves saree blouse with round neck pattern and kalamkari work. Right: Tapsee wearing green kanjivaram saree with a traditional contrast red zari woven border with panchatantra design. Paired with matching short sleeves silk blouse. Gold embellished work around the border. Taapsee in beautiful light yellow designer kota silk saree with silver zari border. Silver zari woven rich leaf work comes all over and on the pallu. It is paired with contrast red designer 3/4th sleeves blouse with hand woven work all over designed by Gaurang.